Would you be able to ship this to Bulgaria? Click on the link below for a simple guide on how to proceed. Feel free to contact me with any further questions regarding your order. Does this holder have anything on it that says cork (like corks around the world) or anything stamped into the metal? I love the holder, but want to use it for something other than corks. BEST ANSWER: There is no wording on the globe. There's no text on the globe. It was different than the usual cork holders...neat design! Purchased this as a Christmas gift, so I don’t have feedback yet from recipients. Nevertheless, I believe that they’ll enjoy this unique decorative item. 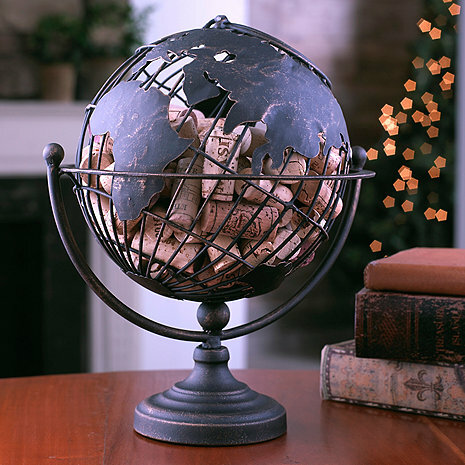 I love my globe cork holder. It’s exactly as advertised, maybe even better. Very please with my purchase and intend to buy more as gifts. Super cute and well made. Fits perfectly on top our kitchen cabinet. I like it it is well made and I would recommend it if you like to collect corks from around the world as I do ! Great decorative piece to hold my wine corks. I do wish it was a little bit bigger to hold more corks but overall very nicely made and great looking. I was extremely disappointed to find this product broken upon delivery to my house. The globe no longer attached to the stand.